" One does not simply walk into Mordor. Its black gates are guarded by more than just orcs. There is evil there that does not sleep." 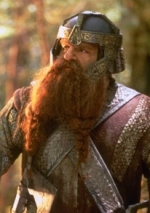 John Rhys-Davies plays Gimli, a Dwarf who joins the Fellowship of the Ring. He also provides the voice of the Ent, Treebeard. John Rhys-Davies was born in Wiltshire, England on the 5th of May, 1944. As a child he spent time in Wales and Africa. While studying at Truro School as a teenager, he became interested in the Theatre. He then studied History and English at the University of East Anglia, but his interest in Theatre Arts continued to grow and he founded the University Dramatic Society. Rhys-Davies continued to learn acting and graduated from London’s Royal Academy of Dramatic Art in 1969, where he had been studying on scholarship. He has a long theatre career, working first in the Madder-Market Theatre, and then in the prestigious Royal Shakespeare Company with many starring roles. This, however would change with his first television role, at the age of 28, in the BCC comedy Budgie. His first introduction to American audiences was with Masterpiece Theater’s I, Claudius. In 1981 he was nominated for an Emmy Award in recognition of his portrayal of Vasco Rodrigues in NBC’s Shogun. This was just the beginning of a long television and movie career in which has worked with such notable directors as Steven Spielberg. He also wrote and performed in the 1990 film Tusks. In the mid-nineties he provided voice-overs for the animated films Aladdin and the King of Thieves and Cats Don’t Dance. He has also worked on a number of Saturday morning cartoons such as Animaniacs and the video games Baldur’s Gate: Dark Alliance, Wing Commander III: Heart of the Tiger and Dune 2000. John-Rhys Davies originally auditioned for the part of Denethor but was cast as Gimli and the voice of Treebeard. He and his wife Deborah have one son.